The Coconut Revolution documents the world’s first successful eco-revolution. Sick of seeing their environment ruined and their people exploited, the indigenous people of Bougainville Island united against the Papua New Guinea army to stop mining giant, Rio Tinto Zinc. A David and Goliath story for the 21st century. RIO Tinto was directly involved in military operations against rebels on Bougainville Island as part of its aim to reopen the giant Panguna copper-gold mine, according to an affidavit reportedly made by Sir Michael Somare. The civil war ended 14 years ago, but an ongoing class action case against Rio in the US was supported by Somare back when he was opposition leader in 2001. 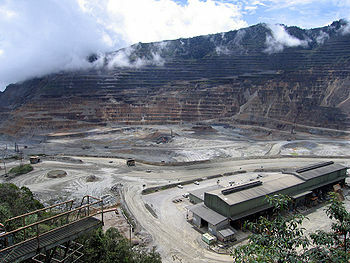 Obtained by SBS’ Dateline program, Somare allegedly stated that the financial influence of Rio Tinto and its subsidiary Bougainville Copper Limited resulted in control of the PNG government. “The government of PNG followed Rio Tinto’s instructions and carried out its requests,” Somare reportedly said in his affidavit. Somare further stated that the PNG government would not have taken military action without Rio’s activity on the island. BCL executive chairman Peter Taylor told SBS Somare’s allegations were baseless, however, former head of the PNG Defence Force Jerry Singarok told the program that Rio had a lot of influence over the decision-making process. This entry was posted in Environment, Land Rights, pollution, Tribes, Water Rights and tagged Bougainville, Panguna Mine, Papua New Guinea, Rio Tinto Zinc, The Coconut Revolution. Bookmark the permalink. The war might look a bit like an “eco revolution”, but it is more than that. When BRA started the war, many dreamt of closing the mine and opening it again within weeks under own management and with less workers from other provinces. There is nothing eco about that.